The Wang Ba – or Internet bar – was warm and welcoming. The receptionist, a twenty-year old woman from Shanxi, ignored the “All visitors must show a valid ID card” notice on the counter and gave me a slip with my mima – a secret number that would enable me to log on – in exchange for two yuan, the fee for one hour. 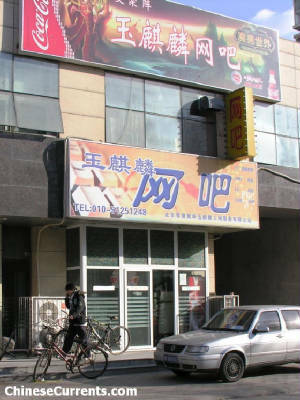 This place was an altogether different set-up compared with the Internet café I had visited a few weeks ago in Yantai, Shandong. Instead of 400 terminals set out in regimented rows, hard chairs, and a smoky atmosphere you could cut with a proverbial knife, here was the luxury end of the market: four well-separated rows of four computers, arranged in pairs; with each pair sharing a comfy two-seater settee with big cushions. There were 9 people in the bar; so most surfers had a settee to themselves. And, judging by their almost-horizontal postures as they tapped their keyboards, each was determined to make the most of the plush couches. The far row of terminals facing the wall were the only ones that couldn’t be seen from the main floor and, not coincidentally, were the only ones to have a wall-mounted camera trained on them. Of the four surfers’ screens I could see from my settee, three were displaying games: the teenager in front of me was on the side of good, fighting a battle against evil, in the guise of a game called World of Warcraft; the two friends sharing a settee to his left were playing an NBA game and a mahjong game respectively (each spending time watching the other’s screen). The NBA game seemed liked a lot more fun; but at least the mahjong player had time to have online conversations with the three other “players”. The young man next to me was writing a blog, tapping ferociously, linking, uploading, framing, copying, pasting, and tapping ferociously again. Mr Li is from the local neighbourhood and comes here daily to write what he describes as his “daily thoughts about life”. He graduated from “three-year college” with an engineering qualification, but has not held a full-time job for more than three months in the three years since leaving college. “I don’t like technical things very much; I guess I studied the wrong thing at college. It’s never long before my boss gets tired of me. “Blogging helps me get things sorted in my mind. I can take the frustrations of daily life and turn them into something quite positive. “For instance, I bought a yoghurt yesterday, and it was off. I tried to get my money back from the xiaomaibu – a small kiosk selling snacks and drinks – but they said I had opened it! How silly, of course I had to open it to find out it was off! He and millions of other bloggers write from the heart and Mr Li’s experience of a brand, or of a small corner shop, have a great influence on what his readers think. Should the criticism of a brand, or of a person, place or thing reach a critical mass, then the resulting Internet “wave” could result in an image crash, a boycott, or even a protest outside an embassy. Particularly so if the “official media” decides to fan the flames of the criticism. So, then, brand stewards, as well as countries, need to avoid upsetting people like Mr Li. In fact, the really bright ones go out of their way to win him over my over-delivering on expectations to the extent that he becomes an advocate. A report published recently by the organisation responsible for analysing the development of the Internet in China has cast more light on this increasingly influential group. 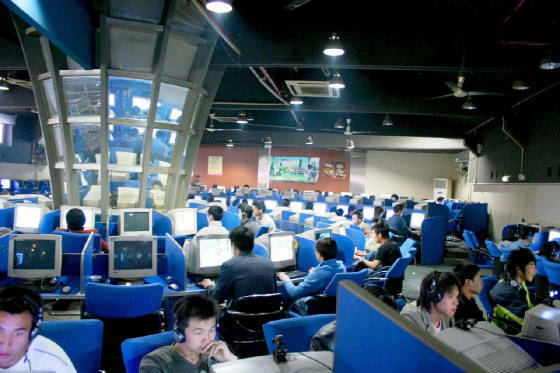 According to their “Survey Report on Blogs in China 2007”, at the end of November there were 47 million people in China who had written a blog. Those blogs were occupying about 73 million “blog spaces”. Approximately, then, one in every four Internet users in China has put finger to keyboard to publish a blog. Of course many of them are what may be described as lapsed or inactive bloggers, but their thoughts, ideas, preferences, grievances, loves and hates are still there for all to read. A few weeks ago, on the provincial island of Hainan, which basks in the South China Seas, Zhang Zilin, a six-foot-tall, 23 year-old from Shijiazhuang, the capital of Hebei province, became the first Chinese to win the Miss World contest. Her blog, hosted by Sina.com (http://blog.sina.com.cn/zhangzilin), received over one million hits in the first few days following her win. All brands, the yoghurt brand that offended Mr Li included, can breath a sigh of relief, however, as no bad experiences were reported. On the plus side, “Brand London”, where she visited shortly after receiving the crown, enjoys pride of place on her home page. The amount of money it would have cost the British Tourist Authority to have made a similar impact – using conventional means – on the ever-expanding group of people who have the means and inclination to take a long haul holiday, is anyone’s guess. Blog readers develop a rapport with their favourite bloggers to the point that the attitudes and preferences that are expressed are bound to seep into their minds. Bloggers who pour out their worries, fears, and insecurities can build a loyal (and caring) readership, particularly among those who are experiencing similar emotional traumas. “It’s therapy for both of us [the blogger and the reader],”said one young woman I spoke with in Yantai. It is clear from the several dozen articles and blogs I’ve read recently – as well as from the many conversations I’ve had – that blogging and blog-reading are the “coping tools” that are increasingly being used to deal with the “emotional disorientation” caused by China’s dizzying rate of change. The “cyber-cathartic” role of blogging also extends to people’s love life. A few years ago, Mu Zimei became famous overnight after she blogged about her affairs with several lovers. More recently, Zhou Qiangling (aka “Madam Rose”), a 51 year-old divorcee surprised her 24 year-old son by setting up a blog, not to mention attracting "500,000 regular readers" by, according to the China Daily, enjoying “on-line trysts and writing about them”. As I was leaving, an influx of eight young men arrived and the counter was a flurry of activity. Two of that number were first time visitors to the café and, as well as handing over their ID card, also had to have their photo taken (with the ID card placed at the bottom of the small camera device on the counter – presumably to cross-reference the card with the photo). One chap said that he had had his photo taken here last week, but didn’t protest when the woman from Shanxi told him that she couldn’t find his record and so would have to have his photo taken again. I managed to finish a bottle of green tea during the several minutes it took to process the courteous and very patient group at the counter. The first two to be processed, both in their early twenties, sat on the settee I had just vacated. Within minutes, they had donned their avatars, and set out on yet another quest to save the world, ridding it of evil doers as they went. 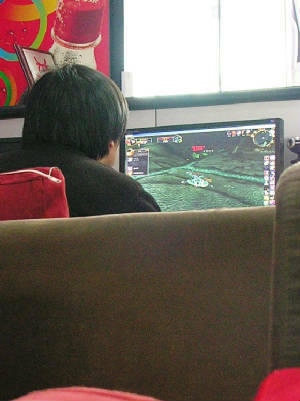 There are somewhere in the region of 120 million gamers in China (of the 210 million Internet users). When it comes to digital therapy, then, slaying virtual dragons rates far higher than exorcising personal ghosts. A guaranteed happy, even Utopian ending to be sure. The China Daily goes on to quote an incorruptible gamer, Mr Sun, as saying: “I feel a great sense of achievement when I punish lots of evil officials.” But there is a barb in the tail of the paper’s otherwise glowing report. Quoting Wang Xiongjun, a researcher in governance at Peking University, the China Daily finishes the article with: "Government officials should be the ones getting anti-corruption education, not local youngsters." In China, it's not just about slaying dragons, it’s the camaraderie among your band of brothers that really matters.